Slow Cooker Chicken Marsala is tender chicken breast slow cooked in a sauce of Marsala wine, garlic, thyme, and mushrooms. It’s a really easy way to make your favorite Italian restaurant dish, and it’s gluten free! You can serve this along with my Garlic Parmesan Mashed Potatoes. You might also like my Chicken Marsala Casserole & Mushrooms! Slow Cooker Chicken Marsala is an easy dinner option that tastes like it came from your favorite restaurant. If you make this for guests, they’ll have a hard time believing you didn’t spend all day over a stove! The chicken has a creamy sauce with hints of garlic and thyme, and that classic taste of Marsala wine. Plus it’s 100% gluten free! You can serve this over gluten free pasta, or with mashed potatoes. I also love to saute some asparagus with this dish, and of course put out some freshly grated Parmesan cheese! 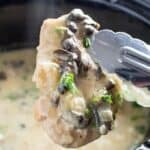 How do you make chicken Marsala in the crock pot? This crock pot chicken Marsala is so easy, you won’t ever want to make it on the stove top again! And I have to admit, I was really hesitant at first. But now that I’ve made crock pot chicken marsala a part of my weekly dinner rotation, I’ll never go back to making it the old way. 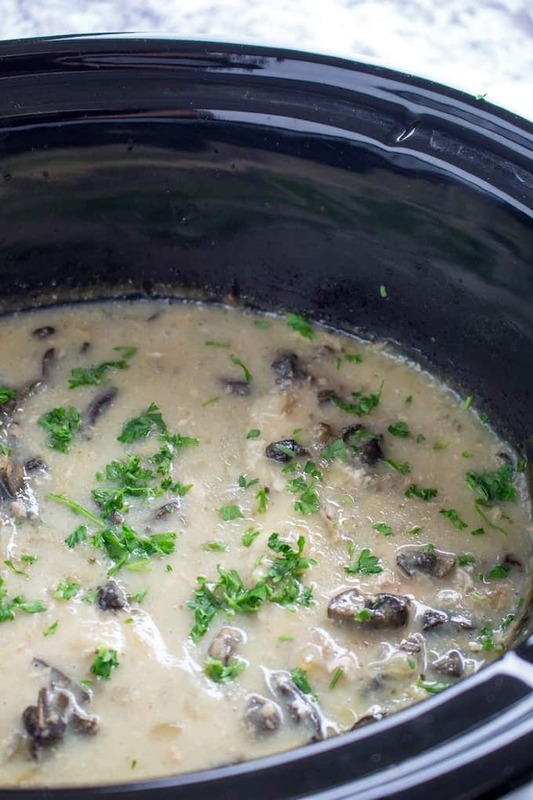 Place chicken in crock pot with onion, mushrooms, and all of the spices. Pour Marsala wine over chicken, then cook for all but 1/2 hour of the slow cooker time. In the last 1/2 hour, whisk together water, corn starch, and 1/2 & 1/2. Pour over chicken and finish the cooking time. Voila! That’s it. See? It’s a really easy chicken Marsala recipe. As long as you can throw things into the crock pot, you can do this! How do you make chicken Marsala sauce? Chicken Marsala sauce is actually really similar to other sauces you might make over chicken. What makes this different and really distinct is the Marsala wine, and the mushrooms. I also add some corn starch to thicken the sauce, and some 1/2 and 1/2 or cream right at the end. You can do this without the cream, too! 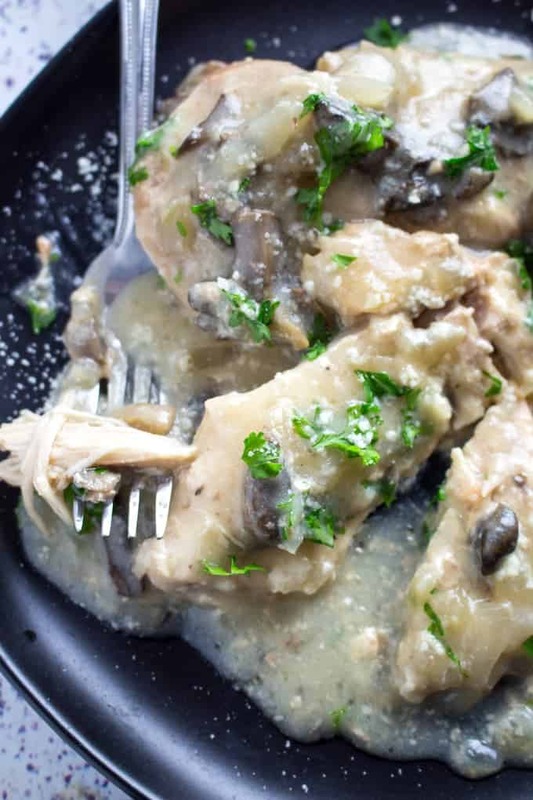 I use corn starch because this is a gluten free chicken marsala recipe! Normally the instructions would be more complicated, but since we’re making this in the slow cooker, you’re going to do this sauce in phases. The chicken cooks in the wine and spices, so you’re going to add the corn starch with water and cream at the very end. Corn starch needs to start out cold to thicken, which is why we’re mixing it with cold water first. 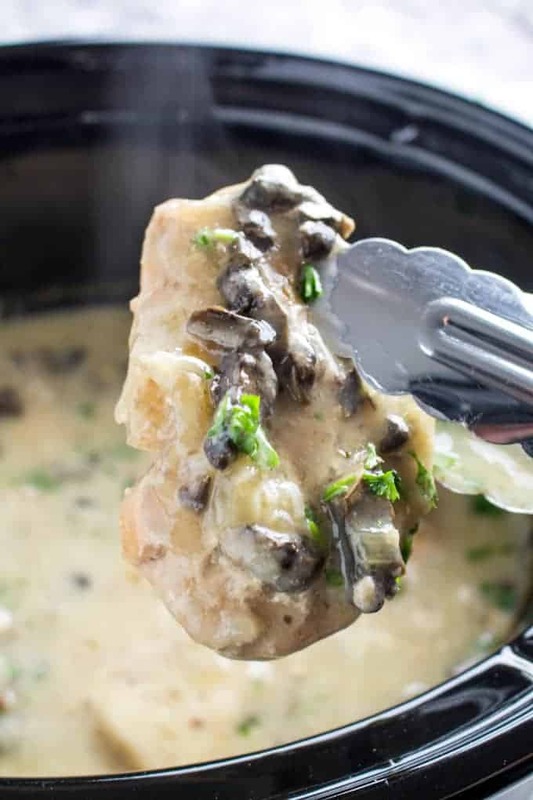 In that last 1/2 hour of cook time, your sauce is going to thicken up and become creamy, savory, and everything you love about easy chicken Marsala to begin with! Is this gluten free chicken marsala? Chicken marsala is not usually gluten free. Often in restaurants you’ll find that the sauce is thickened with flour, or this chicken is dredged in flour and browned at the beginning of the recipe. Which is why I make this dish at home, because it’s one of the only ways I’m going to get gluten free chicken marsala! Plus, it’s my mom’s favorite dish of all time, so we make it pretty often. 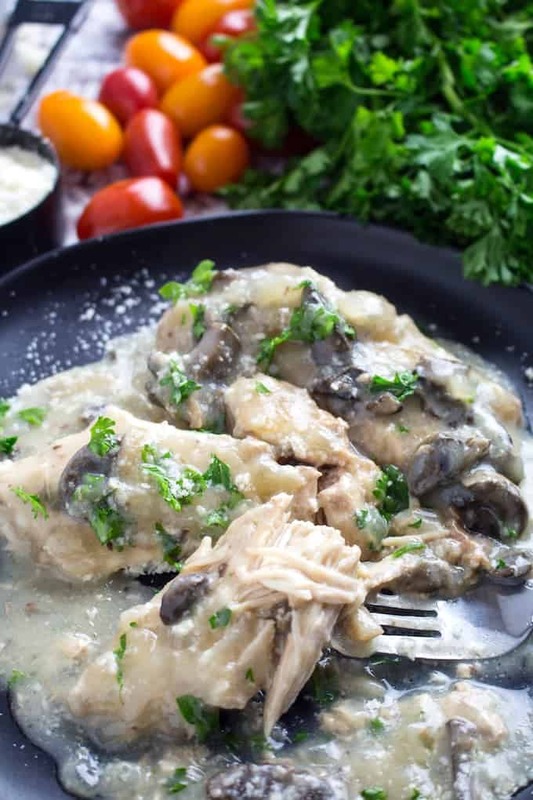 Which Marsala wine is best for chicken marsala slow cooker recipe? There are a few different types of marsala wine. The honest answer is that you want to cook with the wine you like to drink. If you don’t love the wine, you’re probably not going to love what it does to your dish. For this reason, I like to choose the sweeter varieties of Marsala wine, because I generally lean towards sweeter wines. The same goes for any dish you’re making with other white or red wines, too. 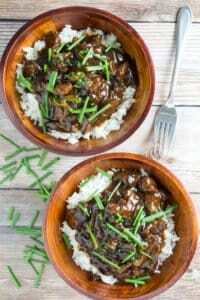 Can I use red wine instead of marsala wine in slow cooker chicken marsala? 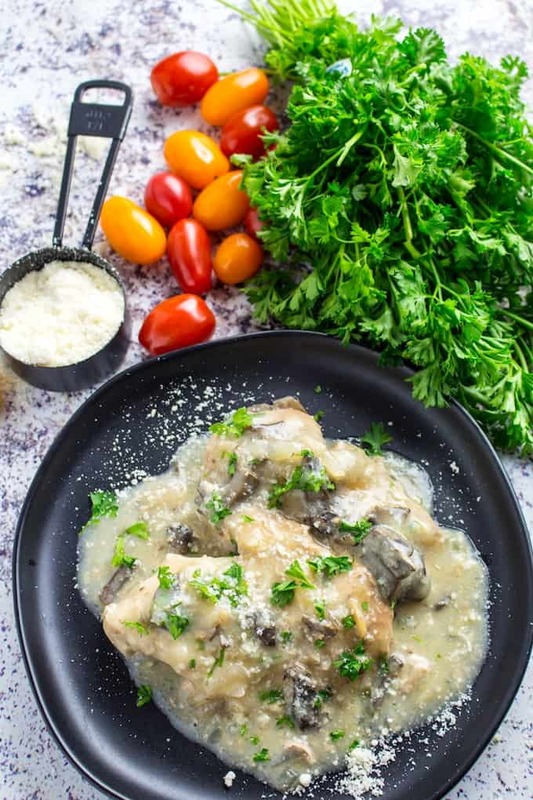 Yes, there’s no reason you can’t substitute in another type of wine for this easy chicken marsala slow cooker recipe. Something you have to consider, though, is that Marsala wine has a very distinct flavor, so you are going to alter the flavor of the dish a bit. It will still be delicious, but it won’t be 100% the same. 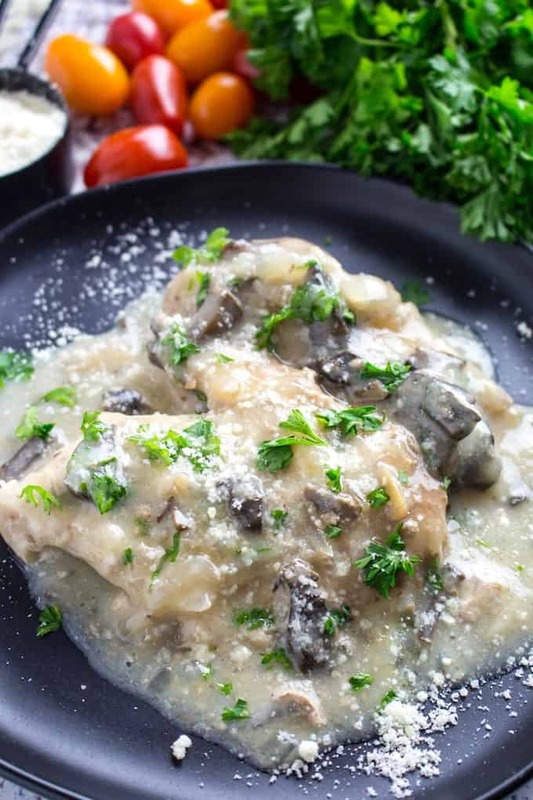 You could technically make this easy chicken marsala slow cooker recipe with any leftover red or white wine that you have. Oh, weeknights just became a lot more interesting, didn’t they? Slow Cooker Chicken Marsala is tender chicken breast slow cooked in a sauce of Marsala wine, garlic, thyme, and mushrooms. It's a really easy way to make your favorite Italian restaurant dish, and it's gluten free! Place chicken breast in the slow cooker with seasonings, onion, butter, mushrooms, and Marsala wine. Cook on HIGH 3 1/2 hours, or LOW 7 1/2 hours. After time is up, in a small bowl whisk together water, corn starch, and 1/2 & 1/2. Pour over chicken and close lid for an additional 1/2 hour. This looks so good! It would be yummy to make for company when you’re in a rush!